Commonly drain cleaners are used to unclog a drain. There are numerous types and brands of drain openers or drain cleaners. Why choose homemade drain openers? Most of the people, especially ones with children are afraid of using industry made chemical based drain openers for unclogging their drains. It is understandable that it is risky to have a jar filled with concentrated corrosive acid or a strong caustic solution in house and is also not environment friendly. These are some of the reasons to why people choose homemade drain openers for unclogging the drains. What are homemade drain openers made of? The main ingredient in any homemade drain opener is baking soda. You would be obviously familiar with the many advantages of baking soda. Unclogging a drain is also an important purpose of baking soda. Baking soda alone cannot do any magic. Read through the article to learn more about how to use baking soda to unclog a drain. 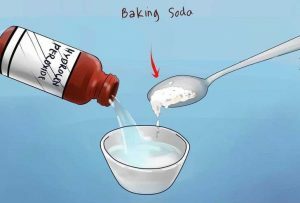 Baking soda is a caustic element or base and vinegar is an acid. Baking soda and baking powder are different elements. Yes, baking powder can also be used for unclogging a drain. How does the baking soda work to unclog your drain? We will also talk a little about baking powder in the article, in the future. Now, just remember that we are talking about baking soda and not baking powder. When mixed together, the acid and the base would neutralize and create salts (sodium acetate) with a large amount of carbon di-oxide and a little water. Do you remember your school volcano project? A similar reaction happens inside the drain. Instead of rising up, the foam would push through the debris and get down the drain. This would help to remove the debris, in the clogged drain. This chemistry would hold good for any kind of acid mixed with a base. Common recipe of baking soda based drain opener calls for half a cup of baking soda (any brand) and one cup of any brand or type of vinegar. May it be rice vinegar, white vinegar or any other, it would suit this recipe. You need not choose any concentrated vinegar to unclog a drain as the milder version you have in your kitchen for cooking would do good. You would need something to make this solution flow through the drain. Water comes handy for this. It is better to use hot water as it would help to break any loosen up clog. Four cups of hot water would be needed. The water should be boiling hot for this recipe. Use necessary precautions while handling hot water. The reaction has to happen inside the drain and thus, do not mix anything in prior to the cleaning process. The first ingredient to go down the drain is baking soda. The next ingredient is vinegar. The reaction starts immediately and you can see heavy frizzing bubbles during the reaction. Let the bubbles subside. This marks the end of the neutralization reaction. The salt and carbon-di-oxide are formed. Now, let the solution get down to the drain. Pour the boiling hot water down the drain as you wash down any baking soda sprinkles around the drain. If you have a drain stopper, close the drain or, you can use a wet cloth to close it. Let it stay for a few minutes, before you start to use the drain again. The common process is to do this right before you go to bed. This gives eight hours of sitting time for the solution and your drain would be completely cleaned. Minimum, you need to allow the drain to sunk in for five minutes before you use it. If you are doing this for the very first time to a drain which has been heavily clogged, you may have to repeat it for two or three times with a few minutes gap between two trials. Alternatively, just one try is enough to remove large amount of debris. 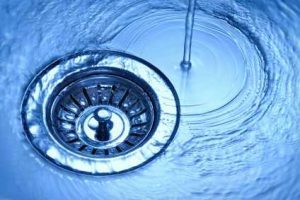 Once you have cleaned your drain, you can continue it as a monthly procedure so that your drainage system would be effective. Sometimes, even after several attempts of baking soda with vinegar, the drain might remain unclogged. This does not mean that it did not work. The baking soda would have loosened up the clog. If you could use a snake or a plunger, you could easily remove the clogged material. Other additives can be added to make it more efficient and we will talk about this in detail, later. 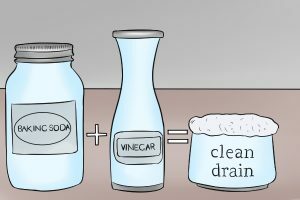 Why does baking soda and vinegar unclog a drain? What does the neutralization does to your drain? First, you should know the reason for a drain getting clogged in the first place. Human waste, hair and other debris are flushed down the pipe every day. This debris gets attached to each other and blocks the further flow of debris and water. As the build-up grows in size, the space for flow of waste gets reduced, thereby reducing the efficiency of the drainage system. Most of the debris gets locked together with soap scum or any fat content. It is almost equivalent to pouring grease into the drain. The soap lather would coat the pipes and pull in as much debris as possible. 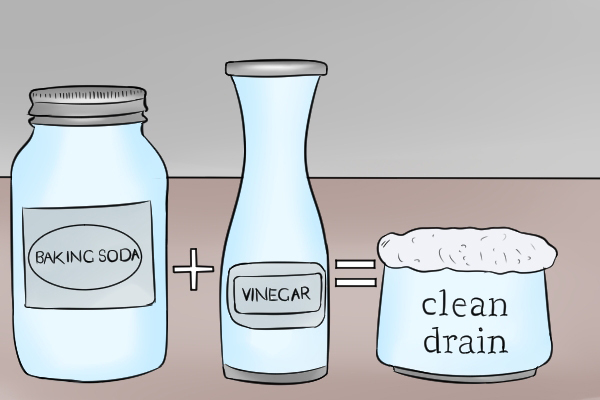 The vinegar in the solution dissolves the soap clogs making debris to drain better. The salt created by the neutralization helps in dissolving the debris. If the drain build-up is strong that baking soda alone cannot do the magic, add a little salt to baking soda. This will scour the pipeline and also help to break down heavy clogs. You can also add a little cream of tartar to clean the metal. Instead of using cream of tartar and baking soda, some people prefer baking powder which is basically a mixture of baking soda, cream of tartar and other acidic agents. Some even add a little detergent or liquid dish washer to the drain, before adding hot water. Though it is not a necessary step, it may be helpful in cases where the clog is too strong. The additives changes from one recipe to another. Each person would choose additives as per his decision. There are people who add juice of a full lemon too. If you want to have better output, freeze the baking soda. Take chunks of the soda and throw it down the drain and then add vinegar. A few people even choose apple cider vinegar, instead of plain vinegar. All that is needed here is an acid. The choice of acid is yours. If you are using apple cider vinegar, the drain would be deodorized too. Just like vinegar, hydrogen peroxide can also be used for unclogging your drain. You would obviously have hydrogen peroxide in your house, at least in your first aid box. The recipe calls for one cup of hydrogen peroxide and one tablespoon of baking soda mixed prior to pouring down the drain. Thus, you would be pouring a mixture of the soda and the acid directly into the drain. It would cause foam and the foam would break down the clog. Flush down with water. The reaction is very similar to that of the reaction between baking soda and vinegar. The hydrogen peroxide is acidic and it reacts with the base and creates sodium hydroxide, carbon di-oxide and water. The burst of carbon di-oxide creates strong bubbles which would clean down the drain. Moreover, hydrogen peroxide decomposes into oxygen which would speed up the cleaning process by speeding up the decomposition. The power of oxygen in cleaning is not something new to explain. Large drains, toilets and garbage disposal pipes would need a little more than just vinegar. You would be already familiar with numerous advantages of having Epsom salt in your house. Add this to that list too. How to make Baking soda and Epsom salt based drain opener bomb? Take two cups of any brand of baking soda. Mix it with quarter cup of any brand of Epsom salt. Add 9 tablespoons of any liquid detergent. It would be better if it is a dish washing detergent. Wear gloves and make balls out of it. Or, use your muffin tin and place a piece of linen on it and add a scoop of the solution on each hole. The content should dry for eight hours or overnight. What you have now is a drain opener bomb. How to use the drain opener bomb? Throw the bomb into the toilet or garbage disposal and pour five cups of hot boiling water and wait for an hour. Flush it with normal water. Your drain is successfully unclogged. Though it is not a completely chemical free solution, liquid detergent and other ingredients are not very harmful. Moreover, the effect of the reaction is very high. This is an important part of the article. One should know the common mistakes that people commit while using baking soda to unclog a drain. Baking soda is the main element in the home-made drain opener solution. But, just baking soda will not work. There should be an acid to create neutralization process. If you had used commercial chemical drain opening solution or pellets, do not use baking soda immediately. The same goes for the reverse too. If baking soda had just loosened up the clog, do not try to use any commercial chemical solution to enhance the process. The baking soda will react with the acids in those chemicals and cause fumes of gases which can be an irritant to eyes and throat. Do not mix baking soda and vinegar and keep your drain opening solution ready before the need. Once the bubbles die, the strength of the solution also dies. There are caustic drain cleaners in the market. Though they are also made with base; they are not as harmless as baking soda. Do not interchange those two. Pouring hot water immediately would make the solution drain down without completing the action. Let the baking soda and vinegar stay in the drain for a minimum of five minutes. This solution does not work on completely blocked drain. If the drain is blocked and the water is not getting inside the pipe, the baking soda and vinegar would not reach the clog and thus, the whole plan renders useless. So, slightly unclog them with plunger or other mechanical equipment and then use the baking soda solution. Why people prefer baking soda for unclogging their drains? More number of people are choosing baking soda over any commercial drain opener. This happens for certain reasons. The cost of a branded and effective drain opener solution would be considerably high. Say, you are planning to unclog a drain, once a month. Your annual expense for drain unclogging would be a considerable amount but, a box of baking soda and a bottle of vinegar would last longer and has negligible cost. Non-toxic, non-corrosive, non-irritant and most importantly, child friendly. Say, a few sprinkles of baking soda ended up on the floor and your child walks over it. Your child would suffer no consequences. This is not the case with any commercial drain openers no matter how mild they claim to be. It is a green drain opener solution. Environment elements do not get affected. Moreover, baking soda would remove any odor in the drain while the others end up with a strong chemical odor. No fumes or irritant byproducts are formed with baking soda. This is not an exclusive list of how baking soda is used to unclog a drain. There are numerous other methods which are used in many households and many additives to baking soda to increase the effect of the reaction. Every recipe will have an acid which would neutralize the baking soda, creates salt and water with carbon di-oxide and creates strong bubbles. The whole solution would be flushed down with hot water to push out the broken down clog. To avoid major clog, repeat this every month or once in two months. You should also avoid disposing grease through drain. After all, grease is the main reason for the clogging. 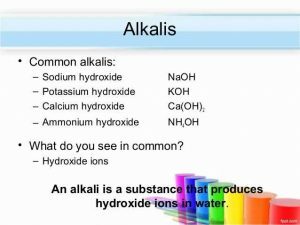 Which Alkali Is Used To Open A Drain? A drain tends to get clogged when debris blocks the path for water and other wastes. During such situation, any drain opener solution can be used to dissolve the debris and remove the clog. There are different kinds of drain opener solutions and it is basically divided into two types based on the pH of the main ingredient in the solution. Both acids and alkali elements are used for opening a drain. Any element with pH greater than 7 is called as alkaline or alkali element. It is also called as basic (base) element. According to common belief, if a drain opener is not acidic, it has to be alkaline. To be fair, there are other forms of drain openers too and it cannot be just concluded as alkali drain opener just because it is not acidic. Now, let us talk about the top ingredients in any alkali drain opener. There are numerous types of alkali compounds that are used for drain opening. The alkali drain opener can be broadly classified into two types. The first type is strong alkali drain opener and the second is weak alkali drain opener. The strong alkali drain opener is usually prepared in industry settings and the alkali used in such drain openers are at high concentration. You may have to use such openers with care. On the other hand, as the name indicates, weak alkali drain openers have weak alkali compounds and thus, are not a threat for personal safety. Let us talk about the main alkali ingredients in each type of openers. This type of drain opener is very commonly called as caustic soda drain opener. This is because of the common main ingredient in this type of drain openers, caustic soda. Caustic soda is a mixture of lye and sodium hydroxide. Both liquid and solid forms of strong alkali drain openers have sodium hydroxide. Lye is a common name used for sodium hydroxide or potassium hydroxide. In some specific brands of strong alkali drain opener, you can find only potassium hydroxide as the main ingredient. Some brands of alkali drain opener provide corrosive liquid formulation. Such openers have sodium hypochlorite which is also called as bleach in very high concentration. The solid version of corrosive liquid alkali drain opener will have sodium hydroxide or potassium hydroxide in granules form. Sodium hypochlorite alone does not cause any benefit, when it comes to unclogging a drain. It has to come in contact with another salt to create better output. It is not safe to mix other cleaning agents with bleach at home. The corrosive liquid alkali drain opener has bleach along with other alkali elements which helps in unclogging the drain. Weak alkali drain openers are commonly used in cases where having a concentrated drain opener in home is considered dangerous. For instance, in a house with an infant, it is not safe to have a strong alkali drain opener. The most common weak alkali drain opener is baking soda with vinegar. Vinegar is a weak acid and baking soda is the alkali here. Any common cleaning supplies have sodium hydroxide in diluted version. Baking soda is sodium bicarbonate. Both can be used in this type of drain opener. In some cases, baking powder is used instead of baking soda. Though it sounds similar, baking powder is not the same as that of baking soda. However, the main alkali in both the components is same. Baking soda also contains sodium bicarbonate with an acid salt. How to use baking soda with vinegar? Any branded alkali drain opener you buy from market is strong alkali drain opener. Only household drain openers can be weak alkaline one as it cannot be pre-made for future uses. For weak alkaline drain opener solution, throw a cup of baking soda into the drain and add quarter cup of any weak acid (any brand and any type of vinegar would do well). Add a liter of boiling water after five minutes. There are numerous alkalis that you can find at home like ammonium hydroxide, potassium permanganate and others. Yet, sodium bicarbonate is the most commonly used one. It is because of its following properties. Easy and common to find and easy to use. These are some of the numerous reasons to why baking soda is very commonly used. Why sodium hydroxide is very common? It can be handled with ease when compared to other strong bases. Strong sodium hydroxide can digest tissues too. Thus, any human wastes like hair can be dissolved, within a few minutes from your drain. Even hard clog made of organic wastes can be digested with ease and leaves out a coffee like structured solid that can be crushed with finger tips. Fast flowing water would be enough to wash the substance out of your drain. It also helps in killing fungi, bacteria and other unwanted micro-organisms. It can easily dissolve grease, oil and other protein based deposits. It can also dissolve precipitated protein. This article talks in detail about alkali used in drain openers. The common alkali substances mentioned in this article are sodium hydroxide, sodium bicarbonate and potassium hydroxide. This is not an exclusive list. There are numerous brands of drain openers around the world. Each brand uses different chemical components with varying strength. There can be other alkalis used for drain opener manufacturing. This article just pinpointed the most common ones of all.